If you can’t beat them, join them. Another great publishing brand has accepted Apple’s in-app subscription terms that require publishers to surrender 30 percent of proceeds from digital magazine subscriptions sold inside apps. 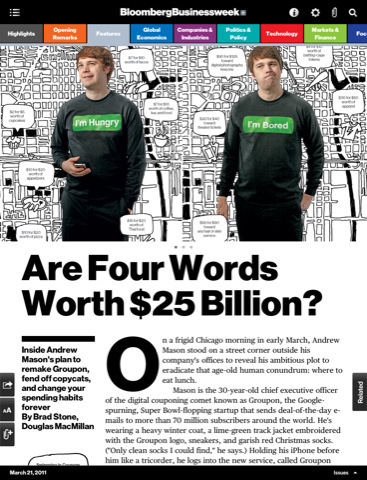 The official Bloomberg Businessweek app for iPad app just launched with the unusual $0.77 price point for an introductory print subscription. Other pricing subscription options include three bucks for four issues which is actually lower than the five bucks price at newsstands. Each week’s issue is available from 10pm on Thursday New York time. Other tidbits and a couple of shiny screenies right after the break. If you’ve already subscribed to their print edition, you’ll get a digital copy free of charge. 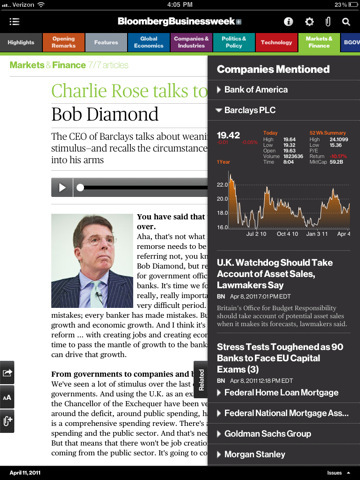 Peter Kafka writes on the Wall Street Journal’s MediaMemo blog that Bloomberg Businessweek for iPad isn’t The Daily-killer. Instead, it’s a typical digital magazine that just reformats the contents of the print edition, adding a bonus introductory video with editor Josh Tyrangiel. Other features include built-in search that works across all your issues, portrait and landscape support, custom personal archives accessible from any issue, social sharing, font sizes and more. 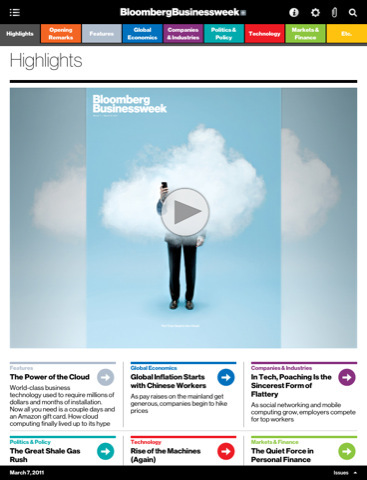 We also learned that nearly one in five subscribers (17 percent) to the print Bloomberg Businesweek edition owns an iPad. The publisher made no mention of an Android version at press time. 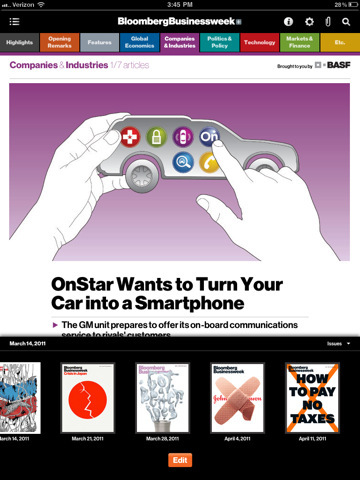 The Bloomberg Businessweek+ app is a free download from the App Store.